Just wanted to say thank you for the really amazing ITIL Foundation training. when we started the course, it was with a bit of uncertainty of what to expect from this course, mainly because I’m more responsible of technical side of things rather than the bigger management picture. after going through this training, I can say that I’ve learnt something that I can definitely apply in my organization. I’ve suddenly got a whole new perspective on how a business-IT relationship works. 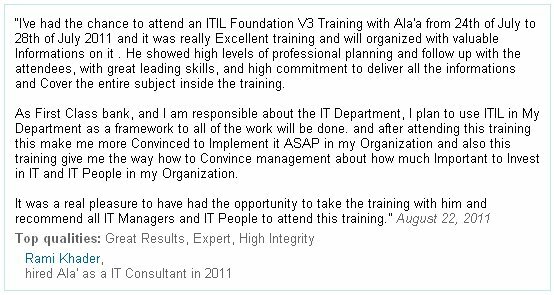 I believe that I was lucky to had the chance to take a class conducted by Mr. Ala;a.
not to miss a chance to be trained by him. I just wanted to let you know how much I appreciate everything you’ve done in this training course.